One of the nice things about the Lycian Way is that there are so many options for accommodation. Below is a description of the general options. We also have a detailed listing of specific accommodation options that you can review online. For the most up-to-date listing (as well as being interactive and fully geo-located), check out our TrekRight mobile app for the Lycian Way – the app is updated frequently as we gather / receive new details). The larger communities, such as Fethiye and Kaş, have traditional hotels and a full range of other accommodation options. Throughout Turkey, though, including in the majority of villages, you’ll also find excellent pensions (“pansiyons” in Turkish). These can be formal establishments comparable to a Bed & Breakfast, or they can be completely informal — a family that simply makes a couple of rooms available in their home and shares their meals with you. 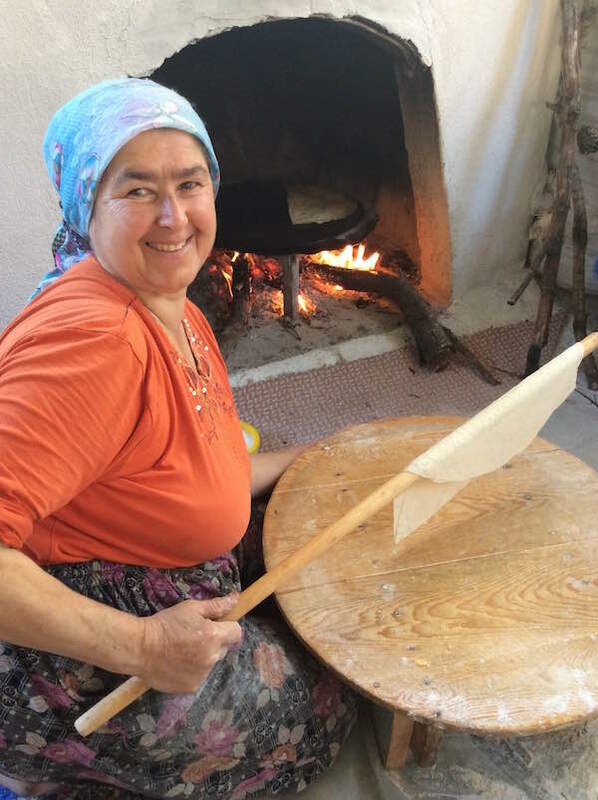 Depending on your travel style, these informal family-style pensions are often a highlight of the trip – true Turkish hospitality is a joy to experience and staying with these (usually) charming, warm, friendly families is a great way to be exposed to that hospitality. The Lycian Way has become established enough now that there are almost always accommodation regularly available throughout the trek (with the notable exception of the long multi-day stretch through the mountains between Myra and Finike, for which ‘wild’ camping is still the only option – though those sections can easily be skipped). We list many great options linked to each community or route section, of course, though there are many more available in most places. As the Lycian Way gains in awareness, the infrastructure to support it is equally growing — new pensions (not to mention tour operators, and so on) are popping up all the time. The logistics associated with trekking the Lycian Way are becoming much simpler. Note: If you are expecting to need to over-night in a remote village where limited accommodation might be available, consider asking your host (assuming you do not speak Turkish) at your prior pension / hotel to call ahead on your behalf and make a reservation (or at least confirm availability). For example, there is only one place to stay in Göynük Yayla – if Nadir Çoşkun (whose home you would stay in) happens to be away that day you would be stuck with no other nearby options. Many people prefer to camp, both to keep costs down and for the considerable freedom and flexibility it provides. 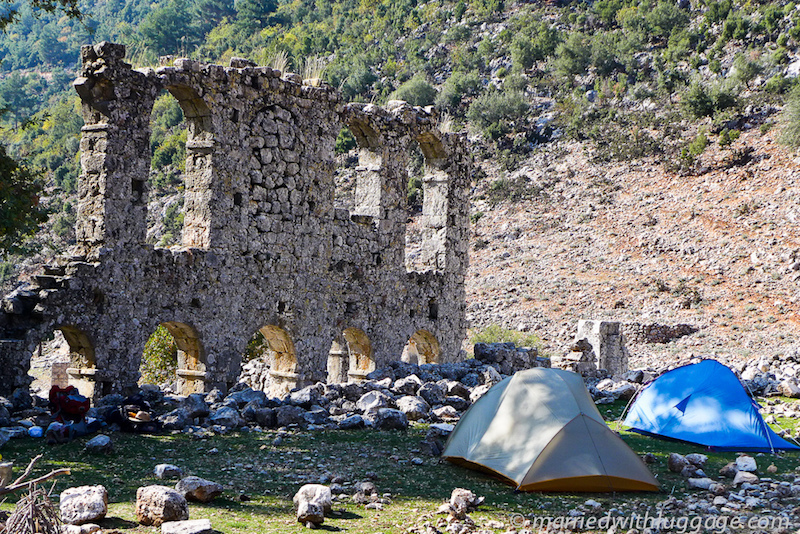 Luckily, the Lycian Way is great for camping! Camping is easy and safe, with lots of places you can pitch your tent (no need for formal campgrounds). That said, there are also many long stretches where it can be difficult to find a sufficiently flat surface upon which to pitch your tent. In the descriptions for each section, we try to note the availability of camping locations. Where possible, we have marked specific places or regions that are good for camping. In some sections we have simply described the general availability (when you find good camping locations, please send us the coordinates and notes about the spot!). The advantage of camping, of course, is the much greater freedom it gives you — you can choose to stop when and where you want, subject only to there being a suitable place to pitch your tent. It also allows you to stop in the most scenic of places, often far from everyone. The downside, though, is you have to carry much more gear. The added weight definitely adds up over such a long distance. If you are going to do camping, make sure your tent has good netting – mosquitos can be quite bad in some areas, though overall they aren’t too bothersome. At higher altitudes you’ll often not see them at all. The season also makes a difference. Note: Many camping sites are near cliff edges or on hilltops. If conditions are windy or if a storm is anticipated, you may want to search out an alternate location. Some people do a ‘compromise’ approach to camping. They stay in pensions wherever possible but carry a sleeping bag / bivouac sack rather than a full tent (perhaps with a ground sheet pegged as additional cover using your walking poles as the structure). A slightly more elaborate approach is the bivouac shelter. These are much lighter than a single person tent and give you more flexibility as to where you can camp (needing much less space). If you want the option of camping and the incredible flexibility it provides you (tired early and in a beautiful location? Call it a day! ), but don’t want to carry full camping gear and/or prefer most nights to be in a nice bed with hot showers and home cooked meals available, then this is a good option. Important – if camping at all, carry a good quality groundsheet — you’ll often have to camp on rough ground and/or with pine needles, etc. beneath you. Another option is to do a ‘supported’ trip, where you arrange for someone to pick you up and drop you off each day and handle moving your luggage along. You stay at pensions the whole way and only travel with a light day pack. There are a few stretches where this won’t work, but otherwise this is easy to arrange. For the few sections where this isn’t an option, there are alternative sections. Note, even through the multi-day mountain trek to Finike it is actually possible to do it without camping. The solution is to arrange for someone from one of Finike’s tour operators to meet you at designated places on the mountain roads to pick you up at the end of each day and take you to a pension in Finike then drop you back to the same spot in the morning. You simply need to detour off the trail to the road as needed. This isn’t the most frugal approach, of course, but there are now several companies doing this sort of service. Note, you should still carry enough water to fully walk the entire way, and carry an emergency Mylar blanket — if your ride doesn’t show up, you want to have the essentials of survival!